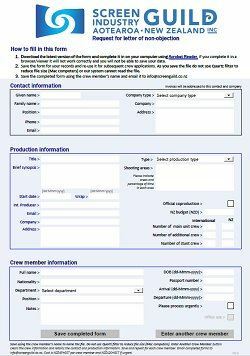 You can save the form with the contact and production information and reuse it for each crew member. Save the form using the crew member's name (Avoid all capitals and punctuation marks). Set the number of applications in the cart. Visa and Mastercard or PayPal accepted. If you are a registered New Zealand company you may skip this step and arrange to be invoiced in arrears. Before starting, download the latest fillable form - we often make improvements. This is a fillable form. Download the form and open in Acrobat Reader for Windows or Mac. Other programmes will not offer the fully interactive form and tend to generate errors. If you complete the form in your browser you will not be able to save it or send it. As you save the form do not use options that offer to reduce the PDF files size - particularly the Quartz Filter on Mac Computers. This removes data so it can no longer be read properly. See screenshot below. Deselect reduce file size when saving on a Mac computer. Click above image for more information on Quartz filters.